With a new graphic, the Nordica Enforcer is back. Nordica wisely decided not to change a good thing this year, leaving the ski's construction, camber profile and dimensions unchanged. Theres no wonder why this ski earned Ski of the Year in 2016. This incredibly versatile ski can go anywhere and ski anything and does so in a forgiving, yet high performing feel that no other ski can match. The rocker/camber/rocker design combined with the shape of the sidecut and profiled tips and tails make it strong in powder and on the groomers. It really is a super versatile platform. You can carve powerful turns even on the firmest snow you can find, but youll also be slashing, smearing, and pivoting turns in soft snow. One of the most impressive attributes of the Enforcer might be its overall forgiving feel for a ski with two sheets of metal. When you need the power and energy metal provides, its there, but when you want to be a little more playful, ski at slower speeds, and make tight turns, its mind blowing how forgiving this ski can be and its ability to quickly change pace. Not sure where youll be skiing but want peak performance wherever you go? This is the ski for you. Sidecut: 133/100/121 mm (169 cm Ski is 131/100/119 mm). Two Titanal Sheets over the edges. Hammerhead Nose - Tapered tip design. Ability Level: Advanced Intermediate to Expert. Early Rise Rocker Tip and Tail. Be sure to put in the "note" section that you want us to mount your Skis & Bindings and to put in "YOUR BOOT SOLE SIZE". To find your sole size it should be imprinted on the side of the boot heel. The Boot sole length is not your foot size or boot size. It is the length in mm's that is embossed into the side or your heel of the boot. 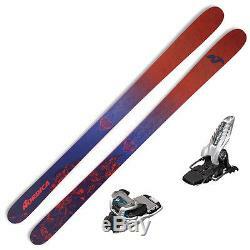 The item "NORDICA ENFORCER Skis with MARKER GIFFON 13 Bindings New 0A614200K" is in sale since Monday, May 01, 2017. This item is in the category "Sporting Goods\Winter Sports\Downhill Skiing\Skis". The seller is "pinnacleskisports" and is located in Stowe, Vermont. This item can be shipped to North, South, or Latin America, all countries in Europe, all countries in continental Asia.